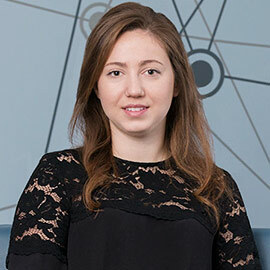 When Monika Roerig (BSc ’15) was in her third year of Laurier’s Health Sciences program, she decided to participate in an inaugural internship program through the Laurier Centre for Community, Research, Learning and Action (CCRLA) and the Laurier Students' Public Interest Research Group (LSPIRG). It was an experience that would end up shaping her future career path. The CCRLA focuses on producing research to advance community well-being and social justice. Its Student-Community Research Partnership, which receives funding from LSPIRG, facilitates community-based research by linking community partners with Laurier student and faculty researchers. Roerig was paired with the AIDS Committee of Cambridge, Kitchener, Waterloo & Area (ACCKWA), a non-profit organization dedicated to creating community awareness about HIV/AIDS and supporting those infected, affected and at risk. “This opportunity allowed me to not only pursue research in my growing passion for HIV/AIDS, but to also contribute to the community,” said Roerig. During her internship, Roerig led a research group of four ACCKWA interns. Based on ACCKWA’s needs, the group explored behaviours and attitudes toward HIV testing and the associated stigma. The results revealed a large knowledge gap about the importance of testing and a need to provide more education to high-risk individuals. In addition to conducting research for ACCKWA, Roerig volunteered at the centre’s outreach program during the academic year. There, she provided clients with safer drug equipment, some of which included syringes, tourniquets, alcohol swabs, and crack kits. In some instances, she and her supervisor delivered equipment throughout the community, including to community centres. By providing large quantities of supplies to individuals, they encouraged safer drug use within users’ own networks. Roerig also traveled to various clinics and rehabilitation centres such as the Grand River Rehabilitation Clinic to provide information on ACCKWA and education about HIV/AIDS and hepatitis C.
While her research project and volunteer placement were short-lived, the experience had a lifelong impact on Roerig – allowing her to experience first-hand the positive impact that community organizations, such as ACCKWA, have on their clients. In addition to her experience in the community, the program provided Roerig with research training and experience through workshops and meetings with CCRLA’s associate director, Sue Weare. Today, Roerig is in her first year of a Master of Arts degree in Community Psychology at Laurier, and expects to graduate in the spring of 2017. She is still an active member of CCRLA and acts as a mentor to the second cohort of student interns with ACCKWA, who are furthering the work of Roerig’s cohort. Her master’s thesis explores the relationships between those who inject drugs and their physicians. She is working with Ketan Shankardass, assistant professor at Laurier and associate scientist at the Centre for Research on Inner City Health in the Keenan Research Centre of the Li Ka Shing Knowledge Institute of St. Michael’s Hospital, Toronto. Roerig is also involved in another placement, this time at Carizon, a multi-service organization specializing in children’s mental health and community wellness. Her supervisor, Community Services Manager Lisa Armstrong (BA ‘09 & MA ‘11), is a Faculty of Science graduate. As a Carizon practicum student, Roerig says she has gained great insight to working in a non-profit organization at a managerial level, the opportunity to experience programming at different levels, and seeing the positive impact first hand. Once her graduate studies are complete, Roerig looks forward to implementing her research and using her Laurier degrees and real-life experience to make a difference in the community.